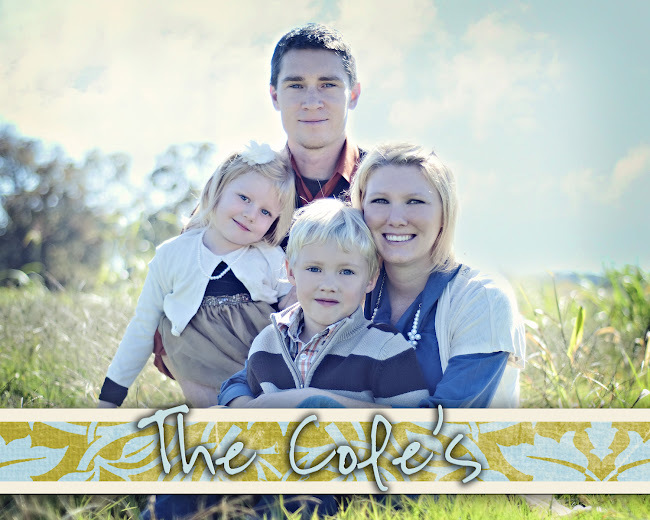 The Cole's: What a wonderful day! For some reason, weekends have been so stressful here lately. I am not sure if it is because we have so much going on each weekend or what but it seems that whenever Dan is home the kids get wild!! So today I decided to take a different stride on things than normal. I decided to stay home from church and just have a relaxed day with family. Dan is still doing the paper route in the mornings so I try to let him sleep in at least a little on the weekends. Today he slept until almost 11:00...it's the latest that he has slept since he started the route in November. While he was sleeping, I let Caleb play PBS Kids games on the internet, which I don't mind him playing because they are pretty educational. I only let him play about once or twice a week so it was treat for him since I let him play for nearly an hour and a half today. While he was playing, Ariel played contently with her stroller and things on the floor. She has started this new thing where she will gather small objects, like the magnets off of the fridge, and her little people and put them in her stroller along with her purses hung from the handles (just like I do when we go shopping) and she will stroll it all over the living room and kitchen. It cracks me up because she hardly ever puts a baby in there to stroll! Anyway, while the kids were occupied and Dan was sleeping, I was able to get the kitchen cleaned...even the fridge wiped down!! When Dan woke up at 11:00, he ate breakfast (the pancakes that I had made at 8:00!!) and then we all got ready and went to see my mom and Jim for about an hour. It was good to see them. It's amazing how well there landscaping gets each time is see their yard. They do such a good job! After we visited with them for a while (it was nearly 2:00 at this point...kids had no lunch (but I packed a lunch for them!) and it is usually their nap time for them) we took them to Tanyard Creek. The kids loved splashing and throwing rocks into the creek. Dan caught two craw-dads for Caleb and Ariel to see. Caleb wasn't sure about them but Ariel just laughed at them as they wiggled in Caleb's hand. We had a picnic lunch there and then soon after we ate, we headed home. Ariel slept on the way home but once we got to the house she was wide awake. Caleb skipped his nap all together. Dan finished our deck tonight. Tomorrow Dan's parents are coming to help put the pickets on our fence. I will be so delighted to FINALLY have a place where I can just let the kids run! I will post some pics of the fence and deck tomorrow. Since the deck was finished, I put the picnic table on the deck and after the kids went to bed, Dan and I enjoyed hamburgers and fried potatoes on the deck with candle light, the stars shinning over us and the lightning bugs in the distance. What a great day to start the summer! Ariel and her stroller of things! Notice her purses on the handle! I caught her reading Sleeping Beauty like this! The "Tree Monster" at my mom's house...looks like it has a runny nose! Caleb kissing the Tree Monster. She loved the water and throwing rocks! Caleb and Dan trying to find Craw-dads. You take the BEST pics!! I didn't know you guys had a paper route! We finally got rid of ours just before Cora was born. Sounds like a great weekend for you and your family!! !